May is Mental Health Awareness Month. Did you know? 1 in 5 children in the U.S. suffers from mental illness. That’s 80,000 children in Bexar County alone! And, only 1 in 5 of those children actually receives treatment. • Half of the children will drop out of high school. • They are twice as likely to start using illicit drugs and alcohol. • They are more likely to end up in the juvenile system. Each year, for Mental Health Awareness Month in May, One in Five Minds asks their supporters and the community to participate in #Maynicures. 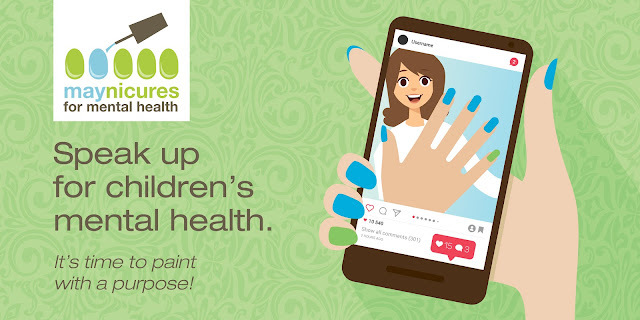 The idea behind #Maynicures is to show, visually and through social media, that one in five children are affected by mental illness by painting our nails (four one color, one another color) and sharing photos of our #Maynicures on social media. This year, they’re kicking off #Maynicures month with a family-friendly event at The Witte Museum on Sunday, May 6, from 1:00 p.m. – 4:00 p.m. Do-it-yourself nail painting stations with nail polish will be available at the event so attendees can paint their nails (four one color, one another color) and share photos of them on social media. This festive event includes other activities in addition to the nail painting such as outdoor games for kids, art activities, face painting, a fun photo booth, and food and drinks (non-alcoholic). This is a family-friendly event with the focus on the one in five children in Bexar Country who suffer from a mental illness. Our goal is to get the word out about the #Maynicures campaign to raise awareness and break down the stigma during Mental Health Awareness Month.